The more we learn about the capabilities of animals, the less it seems we can claim as uniquely our own. Now it appears that we may even have to share our treasured Flintstones cartoons, as we have learned that we aren’t the only species to have enjoyed an ancient Stone Age history. The stone hammers that the team discovered, essentially irregularly shaped rocks about the size of cantaloupes – with distinctive patterns of wear – were used to crack the shells of nuts. The research demonstrates conclusively that the artifacts couldn’t have been the result of natural erosion or used by humans. 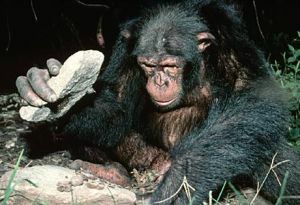 The stones are too large for humans to use easily and they also have the starch residue from several nuts known to be staples in the chimpanzee diet, but not the human diet. This discovery speaks of true prehistoric great ape behavior that predates the onset of agriculture in this part of Africa. The chimpanzee assemblages are contemporaneous with the local Later Stone Age; thus, they represent a parallel “Chimpanzee Stone Age”…. The systematic archaeological study of prehistoric chimpanzee cultures suggests that the “Chimpanzee Stone Age” started at least 4,300 years ago, that nut-cracking behavior in the Taï forest has been transmitted over the course of >200 generations, and that chimpanzee material culture has a long prehistory whose deep roots are only beginning to be uncovered. These findings substantiate the contribution of rainforest archaeology to human evolutionary studies in areas other than the classical savanna-woodlands of East and Southern Africa and add support to fossil discoveries from these other regions indicative of an ancient chimpanzee past. I love it: the Chimpanzee Stone Age! Also, it’s amazing that this tool use tradition has been passed down over 200 generations, and is still in use today. Here’s a nice BBC video clip that shows today’s generation of chimps using the same sort of tools to expertly crack open nuts. The discovery shows that stone tool use is not a behavior that chimpanzees learned recently by watching the farmers who live in the area, as some skeptics believe. Mercader thinks that humans and chimpanzees may have inherited stone tool use from an ancestral species of ape that lived as long as 14 million years ago. At this point, Mercader’s views on the origins of tool use are still open to debate and further research. The fact, though, that there can even be such a discussion about tool use, a capability once thought to so uniquely identify the human species, illuminates how much thinking we have had to do recently about the common characteristics we share with other animals. Interesting stuff. We’ll keep you posted as the story unfolds, and let you know as soon as they discover the first prehistoric chimpanzee satellite TV dishes and computer operating systems. 1Science 2.0, “Hammer Using Chimps Make Us Wonder Where They Learned It,” February 13, 2007. 2Mercader, J., Barton, H., Gillespie, J., Harris, J., Kuhn, S., Tyler, R., & Boesch, C. (2007). 4,300-Year-old chimpanzee sites and the origins of percussive stone technology Proceedings of the National Academy of Sciences, 104 (9), 3043-3048 DOI: 10.1073/pnas.0607909104. 3Archeology, “Ancient Chimpanzee Tool Use,” Volume 61, Number 1, January/February 2008.